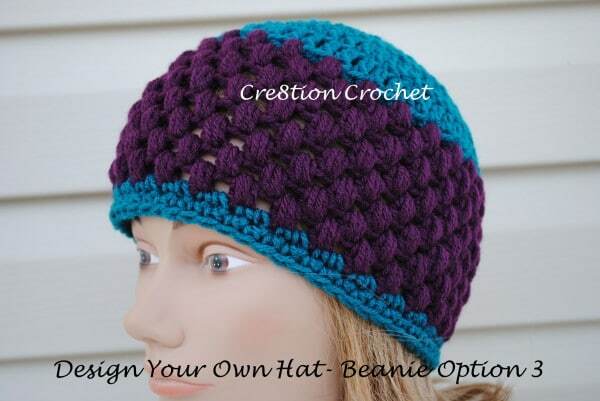 I will teach you the basics to design your own hat or to customize any hat pattern, and I will work with you to create a hat of your own. The hat we will be working on will be a basic beanie, though you will have three different options for style. You can pick from one of the three finished beanies below. We are going to focus on women’s hat sizes but the information can be easily applied to any hat sizing/designing issues. We will also discuss how you can make your hats more professional looking by hiding any seams and having an invisible finishing edge. 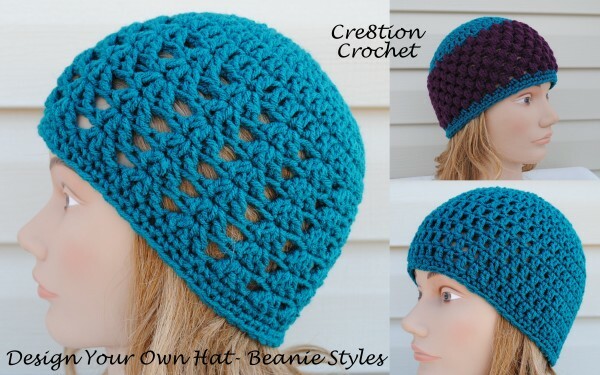 Once you are comfortable with a basic beanie you can check out these other style hats. First, let us discuss how to determine the size hat you will need. There are some general size dimensions for head sizes by age. The general measurement for circumference of a woman’s head is 22 inches. 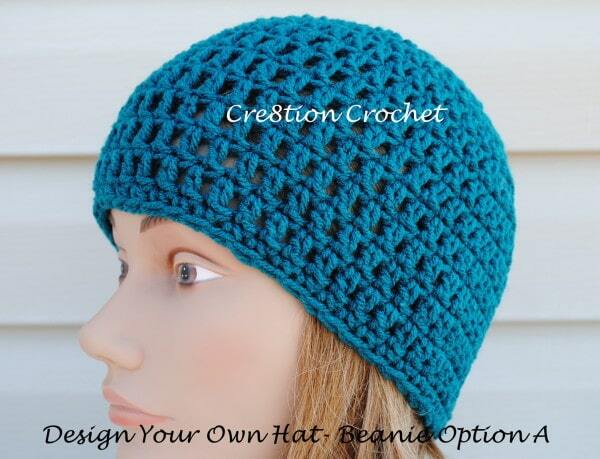 You will design your finished hat to be slightly smaller, approximately 18”. This measurement won’t be right for everyone, some women have smaller heads and some have larger heads, but the hat will stretch if needed but does not need to be stretched to fit either. If you do not know the head size of whom the hat will be made for you can follow a chart. See chart below for approximate head sizes. Now here is where the math comes in. We all remember that pi = 3.14, right? Well what does that mean? Pi is a Greek number or unit of measurement, which is the circumference of any circle, divided by its diameter. It doesn’t have an exact value but for all practical purposes you can use the value of 3.14. You will need to make each hat slightly smaller (2-3”) than the total circumference of the head for whom it is being made. If you happen to have exact measurements it is great but if not you can follow the chart above. But how will I know how big to make the hat without making the whole thing, only to realize it is too big or too small. Well that, my friends, is VERY easy. 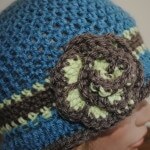 Every hat pattern, made in the round, starts with a certain number of increasing rounds. These are the rounds where 2 or more stitches are placed in specific stitches from the previous round. In order for hats to have a rounded shape the stitches must be increased gradually. I have also found that when you starting hats in single crochet, 10 is the optimum number of beginning stitches. 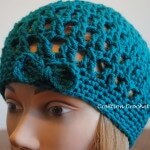 If you start your hat in double crochet 12 stitches is a great place to start. If you are using half double crochet then you can do either 10 or 12, but I prefer to start with 10 stitches. More advanced stitches such as puff stitches can be done in either 10 or 12 depending on the particular stitch. The total amount of increasing rounds make up what is referred to as a “flat circle”. This is what you will measure in order to determine the finished hat circumference. You can be as exact as you want with this measurement. In order to determine the diameter needed for your flat circle you will divide the total hat size circumference (approximately 2” smaller than the head circumference. Example: My head measures exactly 22”. So I would design my hat to be 20” in circumference. In order to determine what my flat circle measurement needs to be I would divide 20 by 3.14 (pi). Well I am certainly not going to get that close, but I can round that to the nearest easily obtainable measurement in inches- 6.25”. I could safely make my flat circle anywhere from 6.0-6.75” so let’s see how it goes. In order to simplify this step for you I have designed the following chart giving you approximate flat circle measurements by age group. *I have found many charts that have exact flat circle measurements but I have found by experience that the results will be far too large. I have made hats for every age group following numerous charts out there and compared them to the actual size required for a good fit. I have since come up with the following measurements which are what I use. I get perfect fitting hats every time. 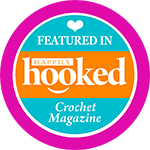 The only time these sizes could be increased would be if you are using an extremely tight stitch, or a type of yarn that will not offer much stretch. Most natural and synthetic fibers have a lot of give. Now I would begin to make my hat. Using whatever yarn I choose with whatever hook size it recommends. I would increase in rounds until I reached as close as possible to my desired measurement. 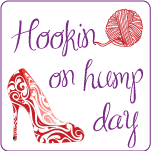 I am going to use Red Heart Classic worsted weight yarn using the recommended hook size, 5.5mm (I). There are three ways to start a hat in the round, you can either make a magic circle/ring, which seems difficult but is really quite easy once you know how. The magic ring will also give you a much more professional finished look. You can read this post to learn how to create a magic circle/ring (link includes video tutorial as well). The other method is to chain 2, and then place the desired amount of stitches in the first chain. However, it is sometimes difficult to get the required (10-12) stitches into the first chain. Round 5: In this round you are going to increase in every 8th st. (this will increase the round by ½ of the amount of stitches previously added per round (6 instead of 12). Ch1. Skip next st. 2dc in the next st. *1dc in each of the next 7sts. 2dc in the next st. Repeat from * around. Last dc will be stitched into the st previously left empty. Sl st into the back loop only of the 1st dc to join round. <54> (6.5”). Circle won’t be exactly flat at this point since we only increased by 6 stitches in this round, but it will still be where you measure since it is your last increasing round. This is the measurement exactly in the middle of the guidelines and where I like to ideally fall! 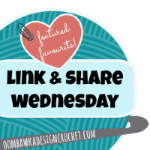 Keep in mind that your measurements will probably not be exactly the same as mine, depending on how tight or loose you crochet, but you will want to end up somewhere between 6.25-6.75” at this step. If you are grossly off you will need to change your hook size. Go up ½ to 1 hook size if you are measuring smaller than 6.25” or go down ½-1 hook size is you are measuring larger than 6.75”. Round 14: 1sc into the first st (do chain or skip any stitches). 1sc in every st around. do not sl st to complete round, instead follow my instructions for the invisible finish. <54>. Weave in beginning tail. Embellish hat as you like. You can find some great flower embellishments in The Flower Repository. Here is where we need to discuss length. There are some guidelines for length but it is really more of a personal preference to decide where the hat will lie when finished. I do not like my hats to rest too far down my forehead or neck, as I find it distracting. Optimal length for me is 7.5” long (measured from center/hole to bottom edge of hat. Some people, however like their hats to be longer, their hair may be very full, they may not like to where their hats snug or they may like them to come down low on their forehead or the nape of their neck. Below are some guidelines for how to decide length of a hat. For now we will continue with the pattern which I will make to the length I prefer. 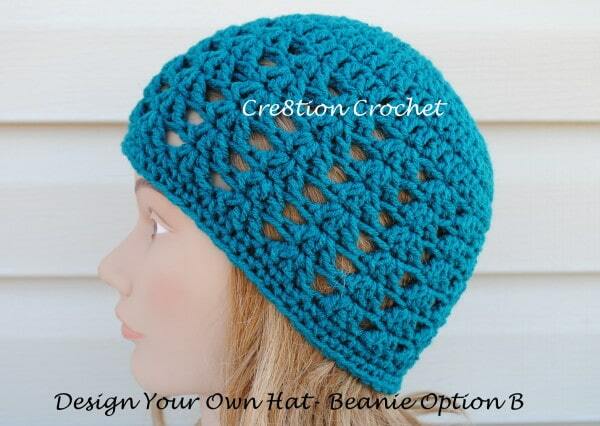 If you would like your hat to be longer simply add one or two rows as necessary. If you want to add a fold up brim add 3-4” to total height (1-1.5” for premie sizes). If you want to add a floppy/sunhat or cloche style brim subtract 0.5” from the total measurement (not including the brim). Round 9-12: Repeat Round 8 until you reach approx. ¾” less than desired length is reached. I made this step to 6.75” long, which was achieved with 6 rows of dc and 6 rows of 3dc clusters. Round 13: 1sc into the first st (do chain or skip any stitches). 1sc in every st around. sl st into 1st sc to join round. Round 7: Ch1. 1ps in same st. Ch1. Skip next st. *1ps in next st. Ch1. Skip next st. Repeat from * around. Sl st into the top of the 1st ps to join round. Round 8: Ch1. 1ps into same space (behind the next ps of the previous round). Ch1. *1ps in next space (between ps’ of previous round). Ch1. Repeat from * around. Sl st into the top of the 1st ps to join round. Rounds 9-14: Repeat round 8 until you reach approx. ¾” less than desired length is reached. I made this step to 6.75” long, which was achieved with 6 rows of dc (including increasing rounds) and 8 rounds of ps. Round 15: *1sc into the first st. 1sc in next sp. (do chain or skip any stitches). Repeat from * to join round. Sl st into 1st ps to join round. A tape measure is placed on the forehead, above the eyebrows and slightly above the ears, and passed around the head, ensuring that the widest part of the head is included. Place a tape measure on your forehead where you want the hat to lay. Pass tape measure over the back of your head and measure to where you would like the hat to lay on the nape of your neck or back of your head. Take that total measurement and divide in half. That is how long you want to make your hat. Keep in mind that different stitches will require different dimensions. You can increase specialty stitches such as a puff stitch, shell stitch, X stitch, etc. However, the flat circle sizing will be different due to the fact that those stiches are larger and have far more give. I recommend using a standard stitch in the increasing rounds and to increase 1-1.5” smaller than typical for each age group. Different style hats also require different fits. 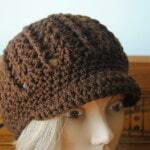 Slouch hats for example do not fall into any sizing categories as they are made to be very loose or very tall. The band size however will follow the measurements more closely. (To measure circumference using the band simply measure the band at its widest point and double it. That will give you an approximate circumference). Hipster style hats are worn shorter but are typically wider. Cloches are tighter at the head to really accentuate that bell shape. 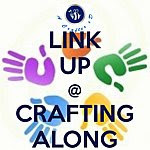 As you design more you will learn how to modify the size requirements for different styles and stitches. Do not be afraid to experiment, you can always rip it out and start over… that is how you will learn.